I’m in the Department of Archaeology, University of Leicester, specialising in medieval urban archaeology and history, particularly late medieval Coventry. I have an MA in Managing Heritage Sites and a Master of Business Administration (MBA). I also work for the Prince’s Foundation. I was born and grew up in Coventry. I’m a copy-editor and proofreader for academic publishers, businesses and authors. I’m also a writer and I’m currently writing a number of guidebooks for the Churches Conservation Trust / Jarrold Publishing. In the past I’ve worked for the museums, heritage and tourism sectors and have an MA in Arts and Social Sciences and a Diploma in Museum Studies. I studied the city of Coventry as an architecture student and became fascinated by the city’s diverse and significant past as well as the contrast with today’s perception of Coventry. I work for the Stanton Williams architects who have designed an extension for the Belgrade and Compton Verney. I enjoy working sensitively with existing buildings and focusing on context. We want to share knowledge about medieval Coventry using a mix of traditional and innovative techniques based on the latest digital technologies. Coventry has a rich medieval story that deserves to be better known. It’s been overshadowed by a focus on World War II destruction and post-war reconstruction. Coventry was actually a Saxon town and so, strictly speaking, Earl Leofric and Lady Godiva fall just outside our focus. 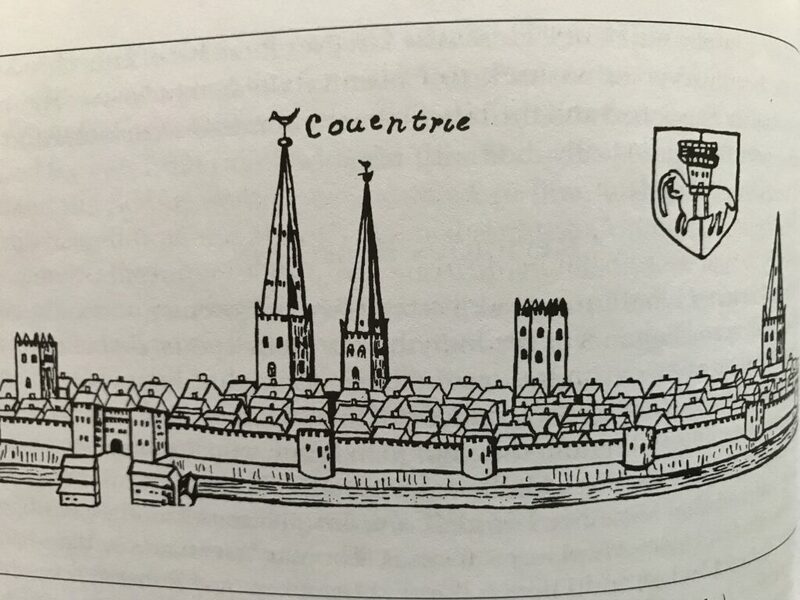 But we feel there is an even more interesting and less well-known story to tell about Coventry’s heyday from the mid 14th to the mid 16th centuries when it was the ‘boom town’ of England and the seat of royal power. The city was the ‘boom town’ of the late medieval period. Between c. 1350 and c. 1500, Coventry grew to be the fourth most populous and fourth wealthiest city in England, after London, York and Bristol. Its growth was based on its role in the international and domestic wool and woollen cloth industries, but it was also an important centre for metalworking, the leather industries and other crafts. The civic ceremonials, processions and ‘mystery plays’ of Coventry were of national importance. 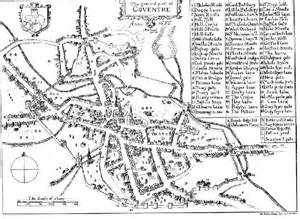 Coventry’s merchants were amongst some of the wealthiest in the country and the Trinity Guild had royal patrons. It was an important ecclesiastical centre, with a Benedictine priory cathedral, two of the largest parish churches in England and three influential friaries. 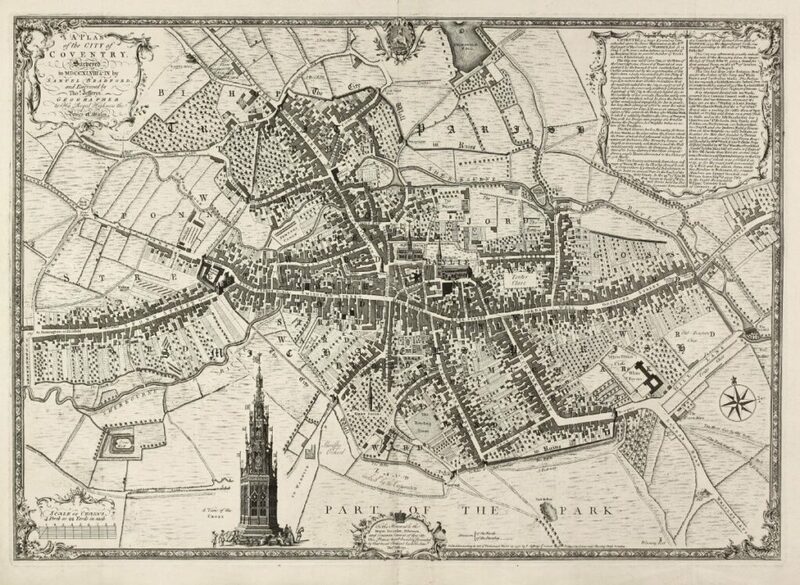 The city, situated at the crossroads of the national road system, and with some of the strongest defences in the country, was of great strategic importance. It was no coincidence that the Lancastrian royal family chose Coventry as a new seat of power in the period 1456–1460 at a time of national unrest. The city played an important role in the Wars of the Roses, and holding Coventry was seen as crucial to controlling the rest of the kingdom. Parliament was held in Coventry twice in the 15th century, as well as a number of Great Councils. And in 1451 was even made its own county! The County of Coventry survived for nearly 400 years. 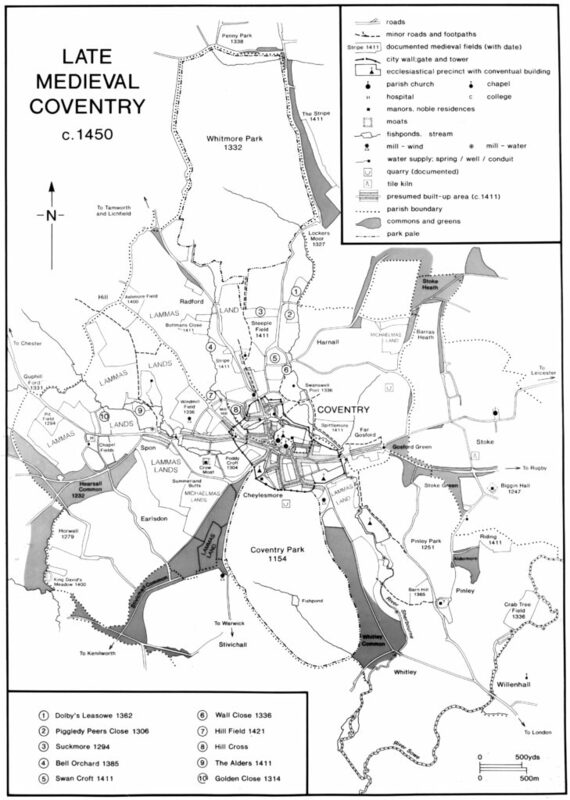 The following maps show Coventry’s development through time. Coventry and the surrounding area. With kind permission of Dr Keith Lilley, Queens University Belfast.